This article is a step by step guide about how you can create your first Visual Studio project using Ozeki VoIP SIP SDK. After reading through this page you will be fully familiar with all the essential terms concerning Visual Studio projects and what you will need for creating your own solution using Ozeki VoIP SIP SDK. Before starting to work on your first project you should think about the product you would finally like to have. What is on your mind? What is your plan? Also think about how Ozeki VoIP SIP SDK fits into that picture in your imagination. How would you like to use it for your project? After getting clear on these issues you can start to search for the possibilities to realize your ideas. You will find lots of useful descriptions and guides on every subject. Ozeki VoIP SIP SDK is a software development kit that can be used to create a softphone or SIP VoIP call services like IVR, autodialer, webphone or a voice conference room. After download you can customize the SDK to provide seamless and efficient VoIP services. Without spending time with implementing SIP basics you can instantly start your project. When you want to create a Visual Studio project, you need to open Visual Studio and choose File->New->Project... menu or press Ctrl+Shift+N (Figure 1). When choosing the New->Project menu, the New Project window will appear where you can choose the application type you want to create. Figure 2 shows the case when you choose a C# Windows Forms application as your project type. On the bottom of the window, you can change the name and the location for the project you create. You can do this later too, but this is the easiest way (Figure 3). When you are ready you can press OK and the project will be created. 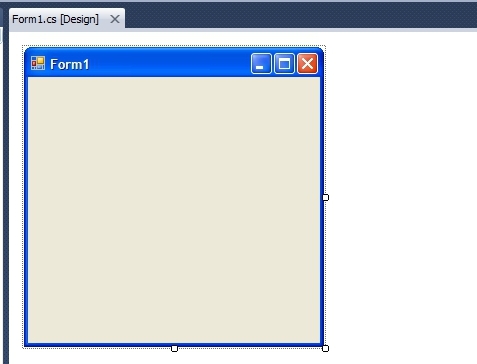 When you created a new Windows Forms project, the first thing you will see is the Design panel with a single Form on it (Figure 4). This is the place when you will be able to build the graphical user interface of your application. 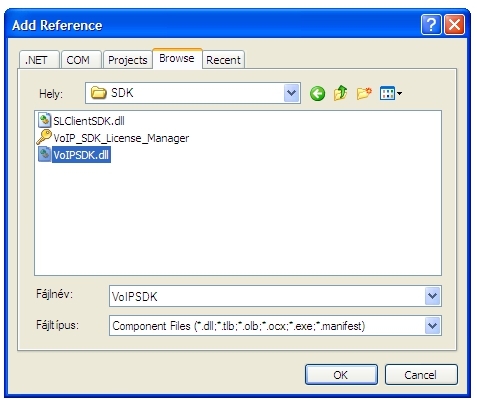 When you want to use the tools of Ozeki VoIP SIP SDK, you will need to add the ozeki.dll file to the project as a reference. You can do this by right clicking on the References label in the Solution Explorer panel (Figure 5) that is usually on the right side of the Visual Studio window. When you pressed the Add Reference... option form the pop-up list, the Add Reference window will appear where you can specify the reference .dll file to add to the project. You need to select the Browse tab on the top and you can browse your hard drive for the ozeki.dll (Figure 6). If you have installed the Ozeki VoIP SIP SDK without user interaction, the .dll fill be found in "c:\Program Files\Ozeki\VoIP SIP SDK\SDK\ozeki.dll" folder. 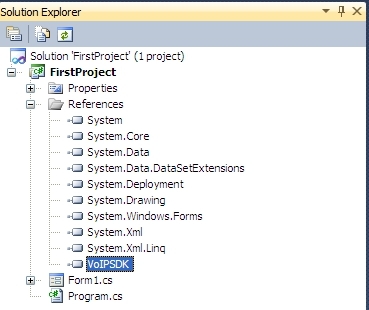 When you have chosen the proper .dll file, you can press ok and the VoIPSDK will be found on the Solution Explorer below the references label (Figure 7). When you have added the Ozeki VoIP SIP SDK to your project, you can start programming and you can use the SDK tools in your program freely. This article introduced you the basic knowledge about how to create your first Visual Studio project and showed how Ozeki VoIP SIP SDK can help you to fulfill your wishes about this topic.